the beauty and truth of simplicity is always important, but especially so this time of year. good luck to all of us in trying to keep things simple and making the hidden visible. Wittgenstein is not someone I'd associate with simplicity, but that's a wonderful quote. The song selection is great too. After loving the holidays as a child, I came to resent them as a young to early middle-aged adult and now have a more mixed view. I feel a typical mix of nostalgia, sadness, loss, love and regret. But mainly I can enjoy the simplest memories of bells ringing and favorite old recipes and not place any judgment on the holiday itself. That's a great song, and such poignant images, too. 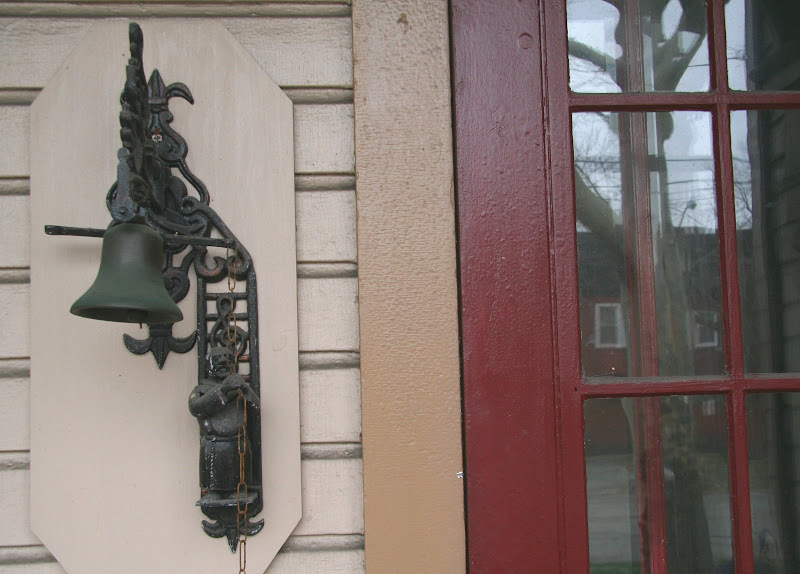 Nice photo of the bell by the door; homely and yet elevated by the season. Thanks, Kimy! Sometime during the period February 11 through 16 is when we would be headed in your direction. Does that work? good old wittgenstein. love the bell. All posts are interesting, the latest is a Peace March. the monk looking guy on the bell reminds me of santa! Thanks for the song! Lovely way to begin the morning! junk - I identify completely with your thoughts. tut - I am marking the calendar. no travels for me in february - so I'm wide open! look forward to seeing you and L in person! squirrel - it's a sweet bell...a real door bell! coffee - you are welcome all around! megan - a toast to you! coffee - have visited before, good to be reminded. didn't you have a link on your site a while back?